The Offshore of Half Moon Bay map area is located in northern California, on the Pacific coast of the San Francisco Peninsula about 40 kilometers south of the Golden Gate. The city of Half Moon Bay, which is situated on the east side of the Half Moon Bay embayment, is the nearest significant onshore cultural center in the map area, with a population of about 11,000. The Pillar Point Harbor at the north edge of Half Moon Bay offers a protected landing for boats and provides other marine infrastructure. The map area lies offshore of the Santa Cruz Mountains, part of the northwest-trending Coast Ranges that run roughly parallel to the San Andreas Fault Zone. The Santa Cruz Mountains lie between the San Andreas Fault Zone and the San Gregorio Fault system. The flat coastal area, which is the most recent of numerous marine terraces, was formed by wave erosion about 105 thousand years ago. The higher elevation of this same terrace west of the Half Moon Bay Airport is caused by uplift on the Seal Cove Fault, a splay of the San Gregorio Fault Zone. Although originally incised into the rising terrain horizontally, the ancient terrace surface has been gently folded into a northwest-plunging syncline by compression related to right-lateral strike-slip movement along the San Gregorio Fault Zone. The lowest elevation coincides with the deepest part of Half Moon Bay; the terrace surface rises both to the north and to the south. Uplift in this map area has resulted in relatively shallow water depths within California’s State Waters and, thus, little accommodation space for sediment accumulation. Sediment is observed in the shelter of Half Moon Bay and on the outer half of the California’s State Waters shelf. Sediment in the area is mobile, often forming dunes and sand waves. A westward bend in the San Andreas Fault Zone, southeast of the map area, coupled with right-lateral movement along the Seal Cove Fault, which comes ashore in Pillar Point Harbor, has resulted in the folding and uplifting of sedimentary rocks of the Purisima Formation in the offshore. Differential erosion of these folded and faulted layers of the Purisima Formation has exposed the parallel curved-rock ridges that are visible on the seafloor from the headland at Pillar Point. During the winter, strong North Pacific storms generate large, long-period waves that shoal and break over this bedrock reef at the world-famous surfing location known as Mavericks. The Offshore of Half Moon Bay map area lies within the cold-temperate biogeographic zone that is called either the “Oregonian province” or the “northern California ecoregion.” This biogeographic province is maintained by the long-term stability of the southward-flowing California Current, an eastern limb of the North Pacific subtropical gyre that flows from Oregon to Baja California. At its midpoint off central California, the California Current transports subarctic surface (0–500 m deep) waters southward, about 150 to 1,300 km from shore. Seasonal northwesterly winds that are, in part, responsible for the California Current, generate coastal upwelling. The south end of the Oregonian province is at Point Conception (about 365 km south of the map area), although its associated phylogeographic group of marine fauna may extend beyond to the area offshore of Los Angeles in southern California. The ocean off central California has experienced a warming over the last 50 years that is driving an ecosystem shift away from the productive subarctic regime towards a depopulated subtropical environment. Seafloor habitats in the Offshore of Half Moon Bay map area, which lies within the Shelf (continental shelf) megahabitat, range from significant rocky outcrops that support kelp-forest communities nearshore to rocky-reef communities in deep water. Biological productivity resulting from coastal upwelling supports populations of sea birds such as Sooty Shearwater, Western Gull, Common Murre, Cassin’s Auklet, and many other less populous bird species. In addition, an observable recovery of Humpback and Blue Whales has occurred in the area; both species are dependent on coastal upwelling to provide nutrients. The large extent of exposed inner shelf bedrock supports large forests of “bull kelp,” which is well adapted for high wave-energy environments. Common fish species found in the kelp beds and rocky reefs include lingcod and various species of rockfish and greenling. Open-File Report 2014–1260, California State Waters Map Series—Offshore of Pacifica, California, by Brian D. Edwards and others. The GIS data layers for this map are accessible from “Data Catalog—Offshore of Half Moon Bay Map Area, California,” which is part of California State Waters Map Series Data Catalog (Data Series 781). The links below will take you there. Data Catalog—Half Moon Bay Map Area, California. Each GIS data file is listed with a brief description, a small image, and links to the metadata files and the downloadable data files. Cochrane, G.R., Dartnell, P., Greene, H.G., Johnson, S.Y., Golden, N.E., Hartwell, S.R., Dieter, B.E., Manson, M.W., Sliter, R.W., Ross, S.L., Watt, J.T., Endris, C.A., Kvitek, R.G., Phillips, E.L., Erdey, M.D., Chin, J.L., and Bretz, C.K. (G.R. Cochrane and S.A. Cochran, eds. 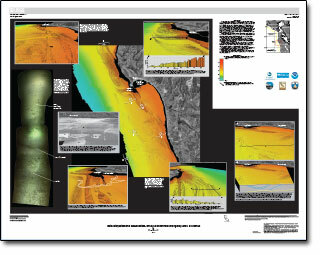 ), 2014, California State Waters Map Series—Offshore of Half Moon Bay, California: U.S. Geological Survey Open-File Report 2014–1214, pamphlet 37 p., 10 sheets, scale 1:24,000, https://dx.doi.org/10.3133/ofr20141214.